Hands up those who wanted a Lyra Belacqua origin story? Philip Pullman has returned to the world of His Dark Materials and delivered one. But apart from being a vehicle for dragging the other characters in, Lyra doesn’t do much sleep, soil herself and feed, mostly because she’s a baby. Malcolm Polstead, the son of Oxford inn owners, is drawn into a conspiracy because he’s observant; Malcolm’s trick is he notices detail. He’s not a big cog in the conspiracy, but he becomes an important one due to circumstance. This plays out large at the end of the novel. But that’s getting ahead and may even be a spoiler. The action mostly takes place in the small confines of Malcolm’s world: his parents pub, his school, the priory over the river where Lyra is sequestered. For most of the story, the point of view is Malcolm’s. Occasionally it switches to Dr Hannah Relf, an Oxford academic and member of the liberal conspiracy, Oakley Street. Like Malcolm, she’s a minor cog, but she works with the alethiometer, often on Oakley street business. The world has taken a conservative turn, and the Church is pushing hard against its enemies. Naturally, Lyra’s parents make their separate entrances and in much the way they are initially presented in Northern Lights, Lord Asriel as a benign presence and Mrs Coulter as malign. 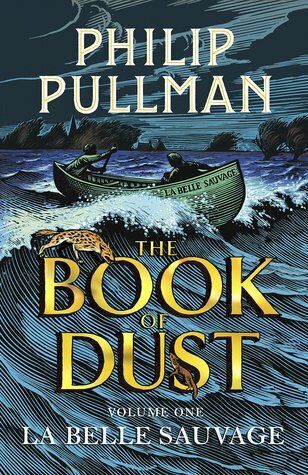 This book is the first of Pullman’s new trilogy, The Book of Dust. Pullman’s style is suited to the young adult or older child. The language is about that of the average 10-12-year-old, but I was surprised to see one expletive, even though it was in character. I liked the characters -immensely, especially Malcolm and his sparring partner Alice. Whether they both feature in the sequel can only be guessed. The main villain was very threatening, and making his daemon a hyena heightened his menace. The only thing I found a little unreal was the flood inundating the Thames’ valley. I enjoyed this book and want to get hold of the sequel the moment the proof copies are produced.